(Spare) Spare B-17 - returned to Molesworth Non-Credit mission. For mission dates and targets see the missions list. 2Lt James S. Parham (CP) - Fifteen missions (All except 179 and 180). 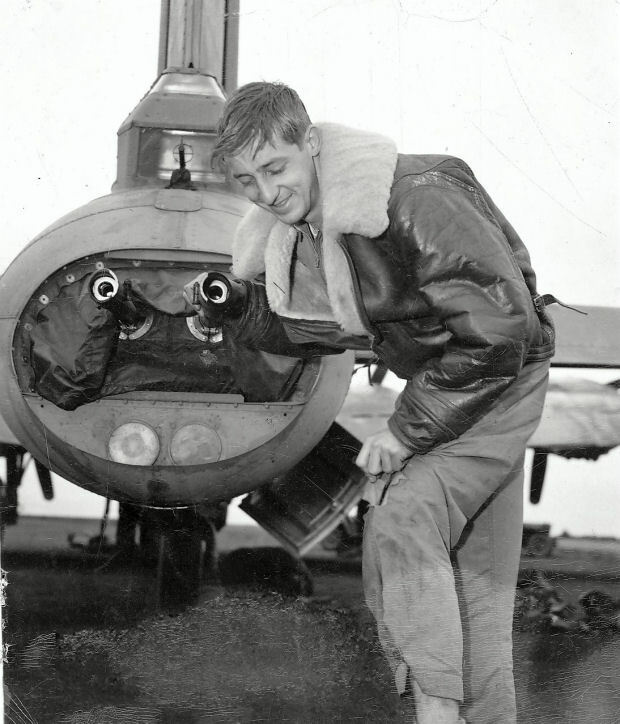 S/Sgt Donald W. Bourlier (E) - As Engineer - Eight missions (158, 160(Spare), 168, 169, 170, 172). As Waist Gunner - Two missions (175 and 179). S/Sgt LeRoy H.M. Foerster (E & WG) - As Engineer - 6 missions (175, 179, 180, 182, 184). As Waist Gunner - 11 missions (151 thru 172). Substitute Waist Gunner used on missions 175 & 179. Use of two Waist Gunners was discontinued on missions 180 thru 187. Did not fly on the last mission #187 with his fellow crewmen. Mission 187, 21 June 1944, To Berlin, Germany in B-17G 42-97096 (no name) (427BS) GN-T. B-17 received a direct flak hit just after "bombs away." It fell out of the formation to the left. Three men were observed coming out of the main fuselage door. It then went into a steep dive and crashed at Schielowsee, Germany. S/Sgt John H. Reed (R) was killed in action. All other crewmen were captured and became POWs. S/Sgt Edward P. Stansbury (TG)(POW) examining a flak hole in his pant leg following a mission.